After further testing I have discovered that for the time being, a hexagonal grid pattern is not a viable solution for this semester’s research with the limited time left. 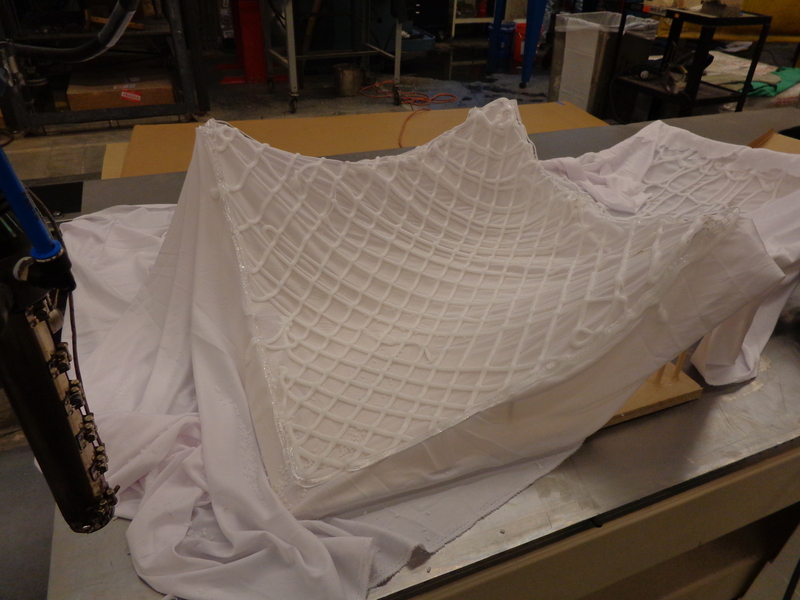 Due to the fact that the plastic is not directly smashed on the the fabric as it was during the 2D panel tests, there is a little bit of drag that is allowed before the plastic hits the suspended fabric—this causes a certain amount of curve smoothing to occur in the the extrusion path. Therefore a diagrid pattern is still the best solutions as it allows the extrusion path to be linear allowing the plastic to settle onto the fabric according to the pattern. 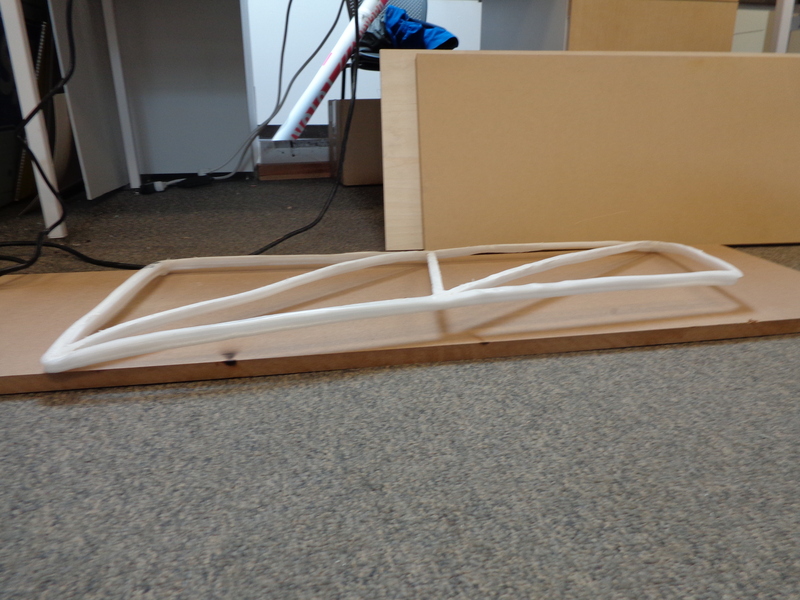 Other issues have been discovered while testing the potential of using the extruded plastic as structure as well. There is a certain amount of warping that occurs due to the plastic cooling as it is printed. This could simply be solved by printing on a heated table. Again, however, due to time constrains with the end of the semester closing in, I have been forced to resort to an alternative solution. I will simply CNC route the structure from 1/2 in MDF. Interesting research at Taubman College of Architecture: a different kind of 3D printing where the print material is not forming a structure by itself but rather becomes a part of a composite material. In this case – fabric but I would imagine the actual applications may also include printing with concrete (or gypsum for that matter) around a pre-made reinforcement structure. As I was watching the robot extrude the plastic (was that polystyrene?) I could not help thinking that almost the same effect might have been achieved with cold-setting construction foams such as Great Stuff. Would need to devise a way to operate the valve through CNC control but the end result would probably be much the same. 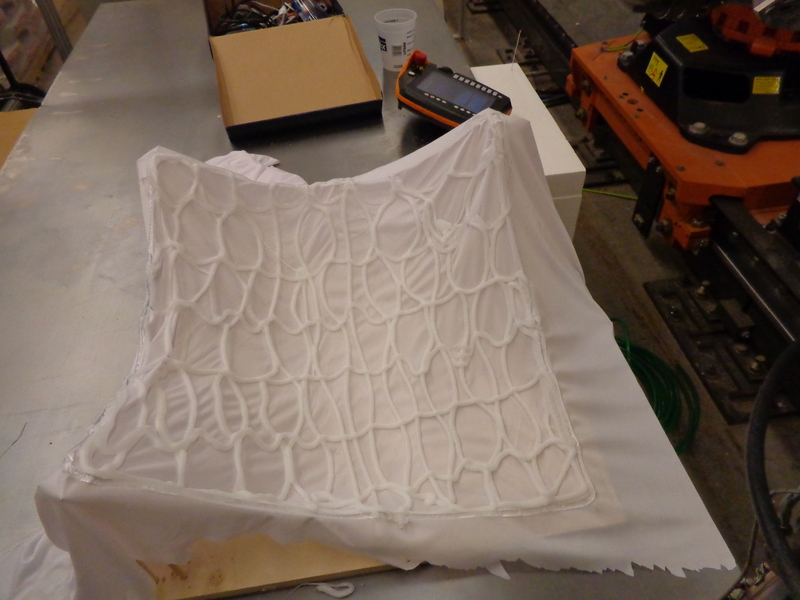 One other interesting angle in using the expanding foams would be to calculate the rate of expansion so that the mesh stretches and bends the fabric as it cures from a flat piece laid out on a printing surface (which would be much easier to print) morphing itself into a 3D shape as it cures. Thank you for the great comments. I would be greatly interested in seeing how this research could be carried out with more traditional construction materials, especially concrete. There has been a particular interest the past few years in the various possibilities and applications of 3D printed concrete. (Yes this is polystyrene) As far as the ability to regulate the valve, that is a simple task. It is simply a matter of a digital In/Out being sent to robot or other CNC machine. This could would even be incorporated in the the code for each job. I also really appreciate you idea about having the tool path remain two-dimensional and allow the plastic to form the panel. If I get a chance to carry this research forward, I would definitely like to test this. Jeremy, I wholeheartedly agree with the premise of your paper on architectural ornamentation (and if I missed a few finer points, it must be because of the tiny white print on black background which is killing my eyes 🙂 ). I am very interested in ornamentation myself and collect any reference materials I can get my hands on about the Arts and Crafts wrought iron and early cast concrete ornaments. boxes. We are yet to see what large scale 3D printing capabilities will bring but they are already becoming affordable and, of course, CNC in general has been in use in ornamentation for a long time now – from wooden trimwork to models for concret cast work. Sorry I ran out of comment space, gotta check out then, Keep up great work! might be however definitely you are going to a famous blogger when you are not already.